I went up to Amy's yesterday for the day to stitch and chat. We had a nice, relaxing visit. I got the latest Cross Stitch & Needlework magazine from her while there. She told me she does have more on back order. I pulled the threads for the Blackbird Design "Land of the Free" inside the magazine today. The threads are so pretty!! I really can't wait to start this one! Well, the boys are having a blast at Sea World right now. I do miss them so much though. I was planning on going back in a week or so, but I don't think I'll last that long. I think I may go back down in a couple days instead. Wow!!!! 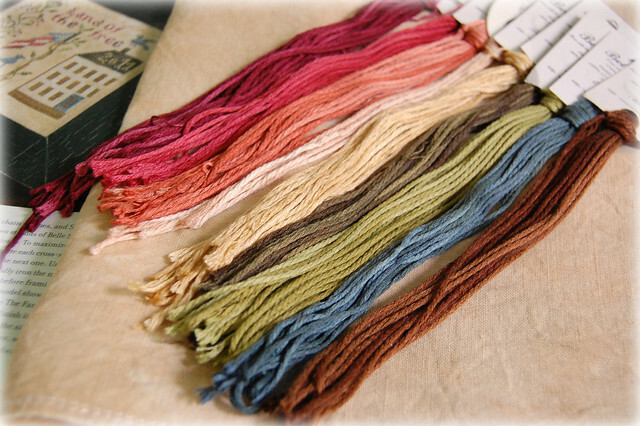 Love those thread colors!!! So pretty!!!!!! You're hopeless! Another pretty start... can't wait to start the BBD too! happy stitching....hope you get to enjoy Charleston while the kiddos are away. Love your new start and the threads are beautiful! Very ADD; oh well, there are worse things, right? You are such a cute mom...missing the kids! Enjoy your SB stitch. It is such a nice one. I gotta get that mazagine! I'm sure I "need" it! These thread colors look indeed great - and make one want to start this design. Beautiful stitching, I love this Shepherd's Bush pattern.And the colors are outstanding. Beautiful new start, Nicole! I just love that SB sampler--I love the sentiment in it. I need to stitch it at some point for my kids as they fly the nest. I NEED to start the BBD, too! Those threads are scrumptious. Love your new start!!!! The colors for the BBD piece are so pretty too. Sail Away is beautiful, love the colors! The colors are gorgeous too for Land of the Free! Another great start! Just give them a call, tell them you love 'em, and think of all the other projects you can start. You are too funny! I have been trying to get my hands on that issue so I can stitch the BBD piece. The threads are just too beautiful! I ordered the mystery sampler last week. I can't wait for it to come! I like the new fabric you chose. Beautiful threads and some really great starts! I see why you have startitus. Hard to choose what to focus on, so why not a bunch of lovely pieces!! That's one of my fav Shepherds Bush designs. How could you resist?? Very cute project, the colours are so pretty! The threads are gorgeous. Can't wait to see the end result. Looove the sampler too. Gotta love stitching ADD! You have made great progress on your Shepherd's Bush start...and I just love the colors in the Land of the Free piece! They are yuumy! Sail Away is one that I have had in my stash for a long time and I still just love it! 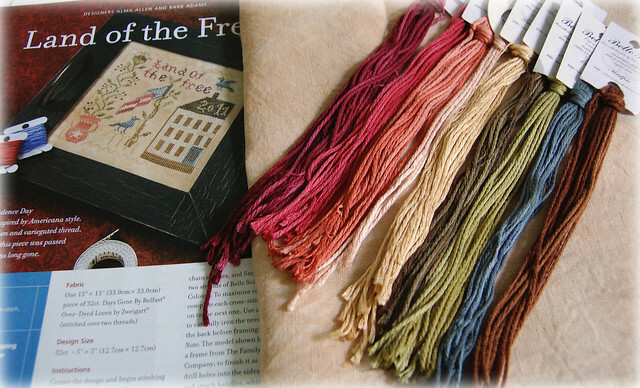 Seeing yours in such pretty colors may help me to get back to some stitching. I wish I could get past my doubts as to whether my stitching measures up. 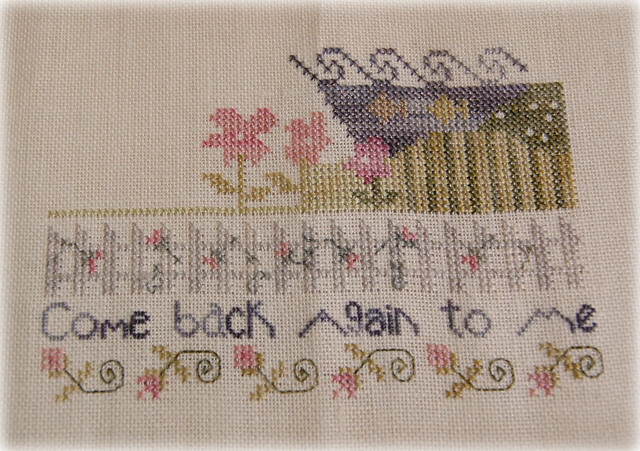 Good old Pam at 3 Stitches has given me a mental block here but I really want to get back into it. It has been so hot here that I have only been doing some reading. Your stitching is awesome! Beautiful new finish Nicole! 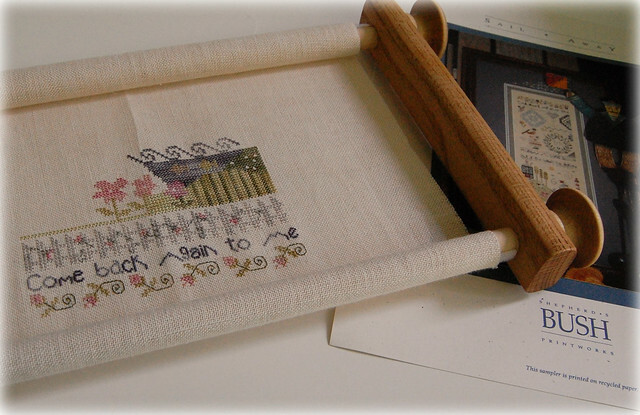 I love this and it is that time of year where stitching patriotic samplers is really fun to do!